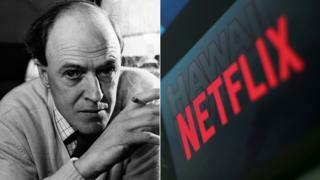 Netflix is set to create a Roald Dahl story universe as part of a deal with the late author's estate. The streaming giant has announced it will bring a slate of new animated stories to the small screen based on works including Matilda and The BFG. Charlie and the Chocolate Factory and The Twits will also be among the "animated event series". The company said the programmes would "remain faithful to the quintessential spirit and tone of Dahl". The author remains incredibly popular with children - it's estimated he has sold more than 200 million books worldwide, with his stories available in 58 languages. Felicity Dahl, the author's widow, said it was "an incredibly exciting new chapter for the Roald Dahl Story Company." She added: "Roald would, I know, be thrilled." Melissa Cobb, a spokesperson for Netflix, said: "We have great creative ambition to reimagine the journeys of so many treasured Dahl characters in fresh, contemporary ways with the highest quality animation and production values." Production is set to commence on the first of the animated series in 2019.